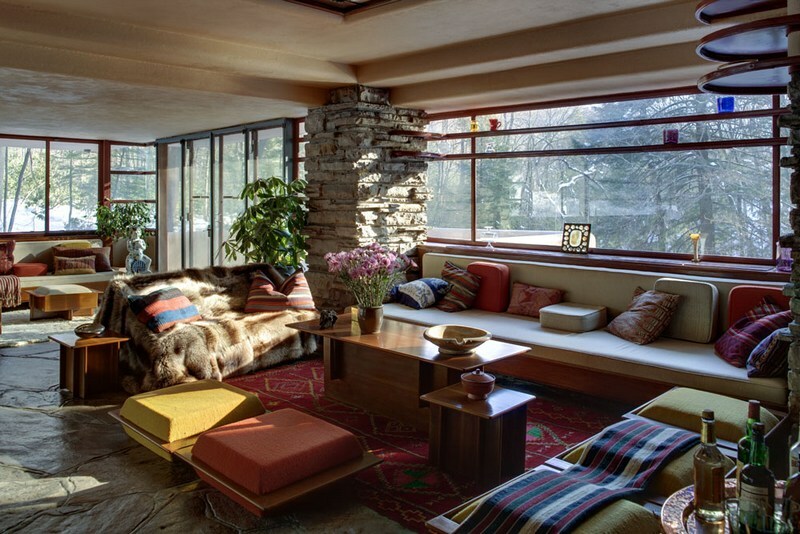 Quite possibly the most famous house in America, Fallingwater is one of Frank Lloyd Wright's most famous creations. To architecture experts, Frank Lloyd Wright was the greatest American architect who ever lived; and one of the greatest the world has ever seen. 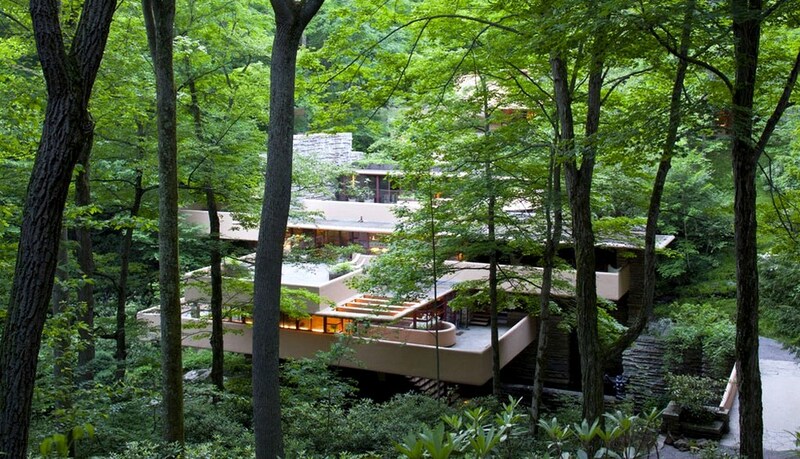 On this 3-day tour, you will be visiting the Laurel Highlands of Western Pennsylvania and getting guided tours at two of Frank Lloyd Wright's famous houses: Fallingwater (the most famous of them all) & Kentuck Knob. In addition, you will also be visiting the Andy Warhol Museum in Pittsburgh, the largest collection of Warhol art and collectibles under one roof. Your tour includes 2 breakfasts & 1 group dinner. On our way home we will also stop at Premium Outlets in Grove City for lunch and for some of you, a brief shopping opportunity. Please note that this tour involves moderate walking, uphill and downhill climbs and stairs! This tour is not recommended for those with mobility issues or those who have difficulty climbing stairs. $49 deposit per person to reserve seat. Round trip transportation from Toronto on deluxe bus with restroom and WiFi. Admission & guided tour at Fallingwater House. Admission & extended guided tour at Kentuck Knob House. Admission & self-guided tour at Andy Warhol Museum, Pittsburgh. Two nights accommodation at Hampton Inn & Suites, Uniontown, PA.
One buffet dinner at a fabulous local restaurant in the Laurel Highlands. 2-hour shopping stop at Premium Outlets Grove City. Tax-free shopping on clothes and many other categories in PA! Stop at Duty Free on return to Canada. Escorted tour with ShortTrips.ca tour director available at during tour. ﻿All prices are per person, in Canadian dollars. ​Taxes & tips are included! Final payment is due by Mar 22, 2019. Reminder emails will be sent a few days before due date. Final payments are not refundable once paid. Frank Lloyd Wright was an American architect, interior designer, writer, and educator, who designed more than 1,000 structures and completed 532. Wright was recognized in 1991 by the American Institute of Architects as "the greatest American architect of all time". Wright was a leader of the Prairie School movement of architecture and his work includes original and innovative examples of many building types, including offices, churches, schools, skyscrapers, hotels, and museums. Completed in 1937, Fallingwater is a 20th Century architectural milestone, celebrated worldwide and named "Best American Building of the Last 125 Years" by the Journal of the American Institute of Architects. Fallingwater doesn't merely complement the landscape, it becomes one with it. 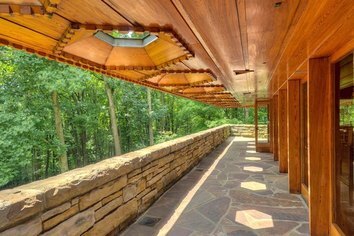 Fully expressing Wright's concept of "organic architecture," the house looks as though it grew naturally out of Bear Run's rocks, trees and water. Basing the structure on three steel-reinforced concrete pads, falling-water-4Wright cantilevered the house over the waterfall. Without relying on any support pillars, Fallingwater projects outward above the shimmering cascade, its form simple, elegant, dramatic, seemingly suspended in mid-air... and yet perfectly integrated into its surroundings. Little wonder, then, that National Geographic Traveler magazine has named Fallingwater one of its "50 Places of a Lifetime," while Smithsonian Magazine has included it in its list of "28 Places You Should See in Your Lifetime." In the more than seven decades since its completion, it has been visited by millions of people-many of them luminaries. Albert Einstein spent time there, as did the artist Frida Kahlo. 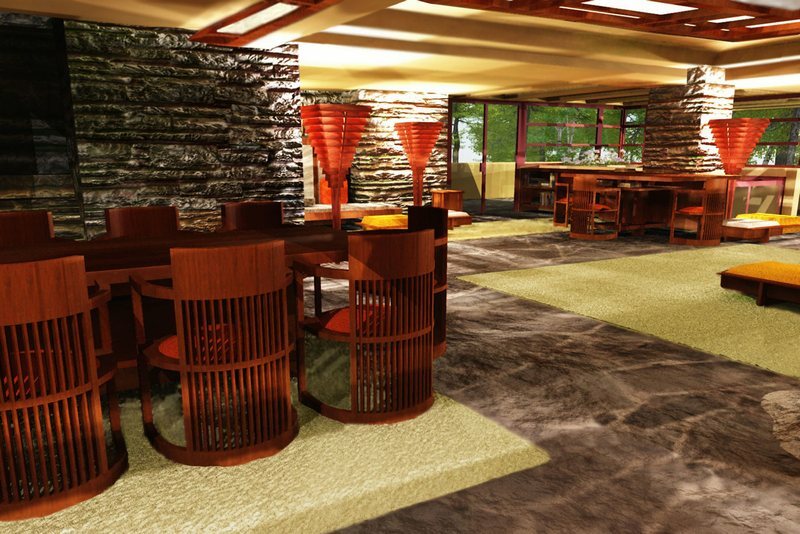 A tour of Fallingwater will expand your appreciation for more than just Wright's architectural genius. 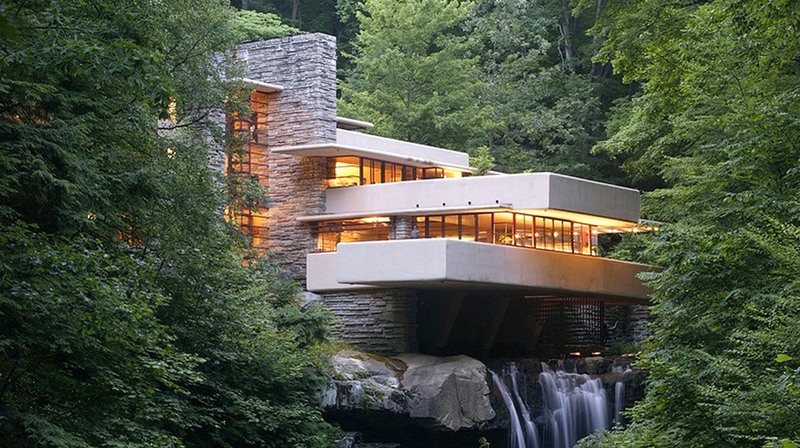 Indeed, Fallingwater transcends mere architecture, fully becoming a work of art. And when you visit, you'll note that it houses works of art by other 20th Century masters, including Pablo Picasso and Diego Rivera. Not far from Fallingwater, Frank Lloyd Wright's mountain house, Kentuck Knob sits. Built on a bluff 2,000 feet above sea level, it stands just below the crest of the mountain with which it shares its name. Described as both "dramatic and serene," the exterior almost appears to be part of the mountain itself. The design for Frank Lloyd Wright's Kentuck Knob banishes typical 90° corners from the home plan. His color palette and the texture of the materials he utilized for the house's interior evoke its Laurel Highlands, Pennsylvania setting, bringing the home, its environment and its occupants into natural harmony. Kentuck Knob is presently owned by Lord Peter Palumbo, chair of the Arts Council of Great Britain from 1989 to 1994 and a member of the British House of Lords. As an additional delight for visitors, he and Lady Palumbo installed a sculpture garden featuring works by Claes Oldenburg, Andy Goldsworthy and others, as well as an actual section of the Berlin Wall. Follow the wooded path to the secluded garden and take your time enjoying this great collection. The Andy Warhol Museum is the largest museum in the North America dedicated to a single artist, and holds an extensive permanent collection of art and archives from the Pittsburgh-born pop Andy Warhol. The museum contains 17 galleries, features 900 paintings, close to 2,000 works on paper, over 1,000 published unique prints, 77 sculptures, 4,000 photographs, and over 4,350 Warhol films and videotaped works. Grove City Premium Outlets is an open-air pedestrian outlet mall with more than 130 brand-name outlet stores, a food court, and one of the Pittsburgh Steelers' official team stores. In 2006, Value Retail News rated it as one of the top 20 outlet centers in the United States. FYI, on Black Friday in 2006, shoppers created a traffic jam 10 miles (16 km) long during the middle of the night on Interstate 79!